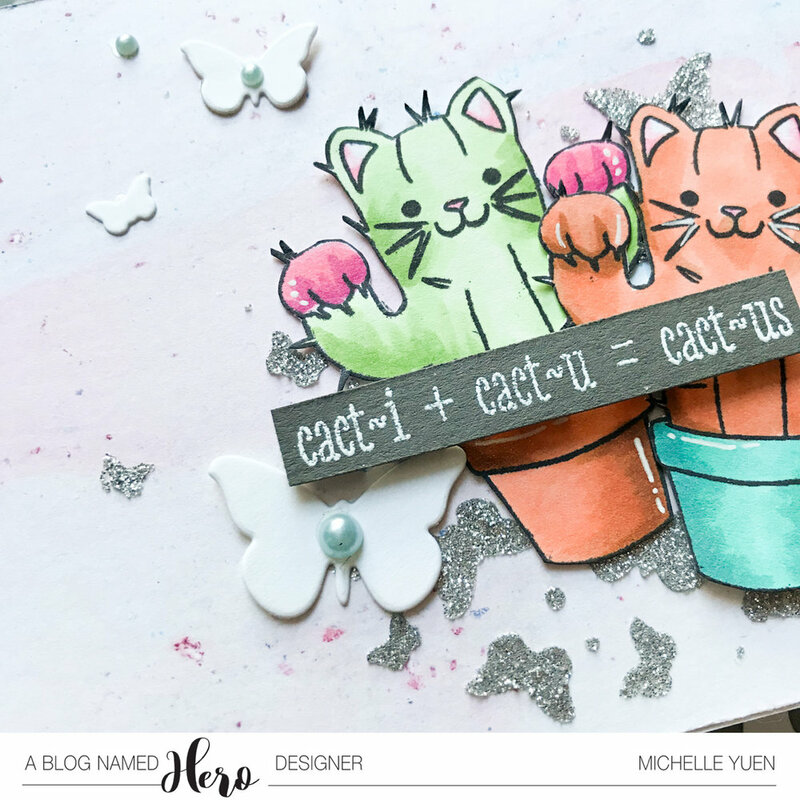 For today's card, I thought that the cacti I colored during The Daily Marker challenge would be perfect for the summer theme! 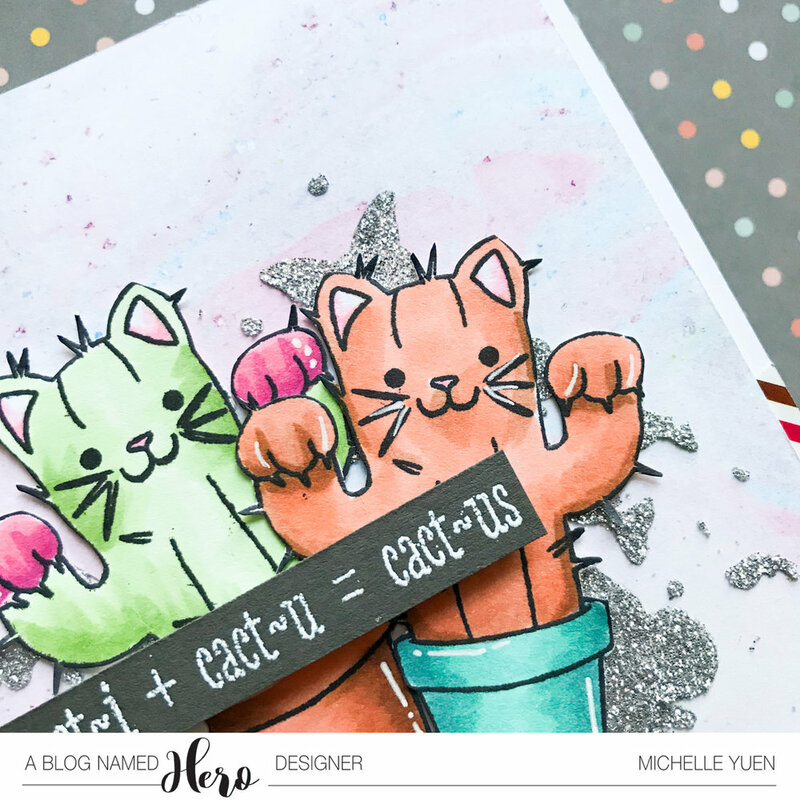 I used both of the "cat-cus" images ;) because it went well with the sentiment. For the background, I used a background piece I had created a while ago using alcohol inks in water. Then I once again pulled out my butterfly background die to create a stencil, and applied some silver embossing paste through this stencil to end up with a fun background of scattered silver butterflies! Then, I embellished with a few of the butterfly die cuts and some pearls. I love how all these layers work together! What do you think? Hope you join in with our challenge if you haven't already! Hello! I hope the first half of June has been going well for you! 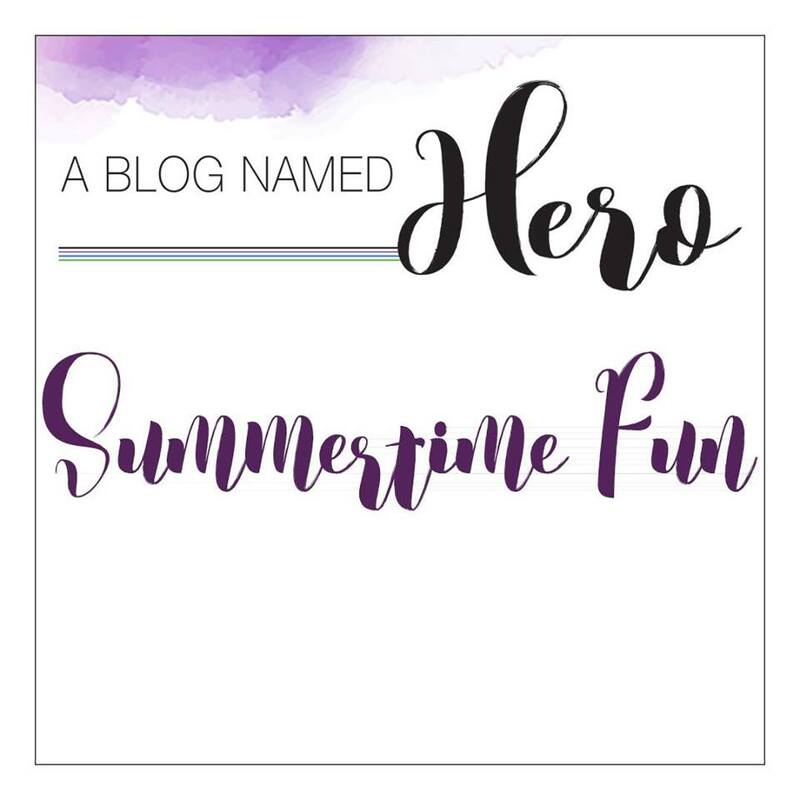 Today, a new challenge starts over at A Blog Named Hero, and this month it is a SUMMER theme! It is no secret that summertime is my favorite thing of all time, so this challenge was so fun for me. I decided to pull out some summery colors of pink and sky blue, and made a cute little animal scene with a stamp layered flamingo and some butterfly die cuts. 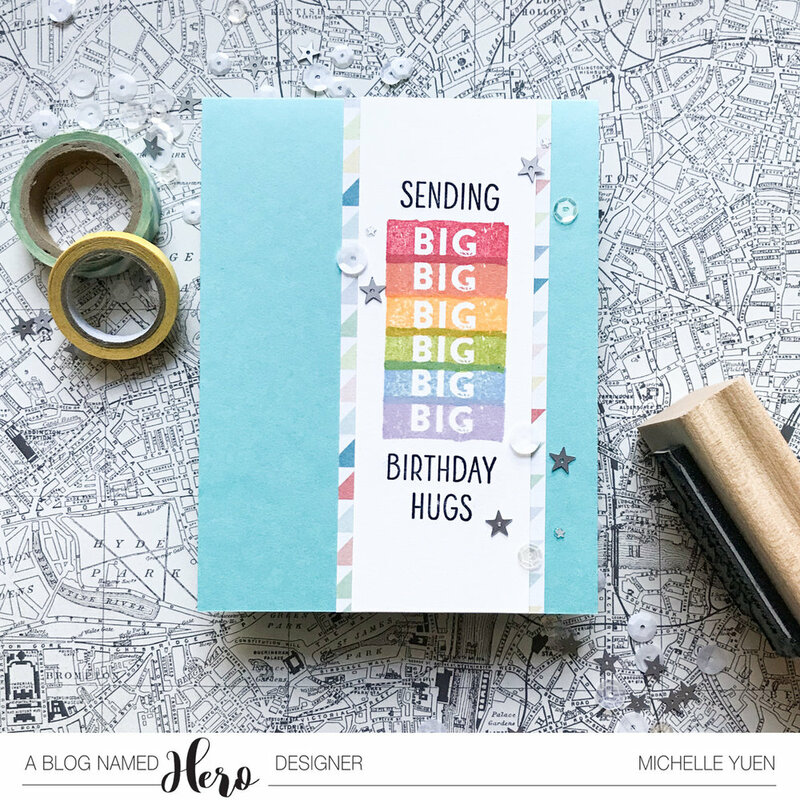 For the base of my card, I went with a technique that I used to do all the time in my scrapbooking days: layering! 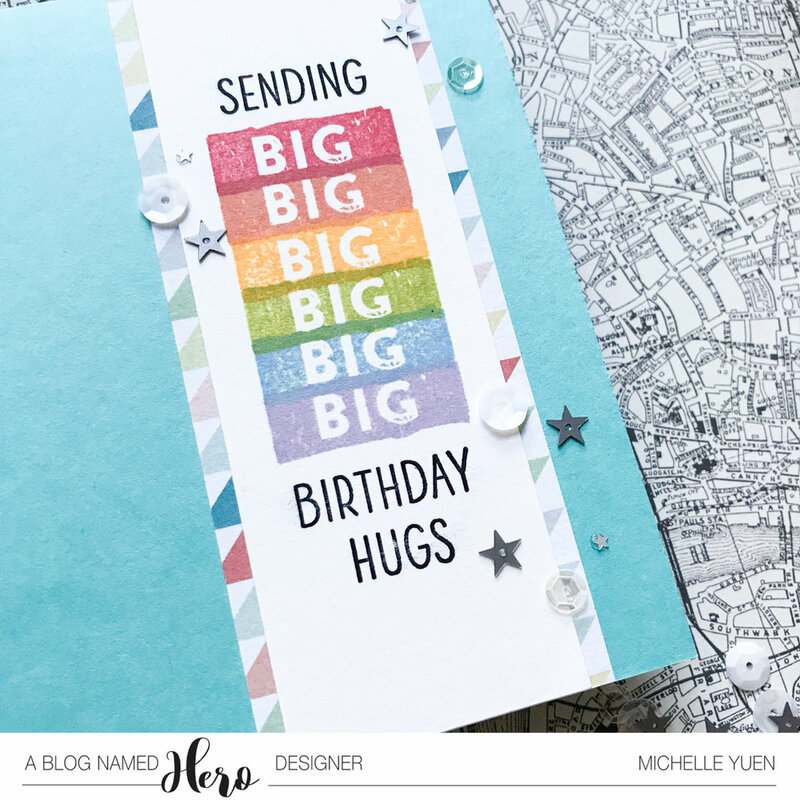 Creating layers with patterned paper is such a quick and fun way to create a unique background and bonus - you can use up whatever scraps you have laying around! 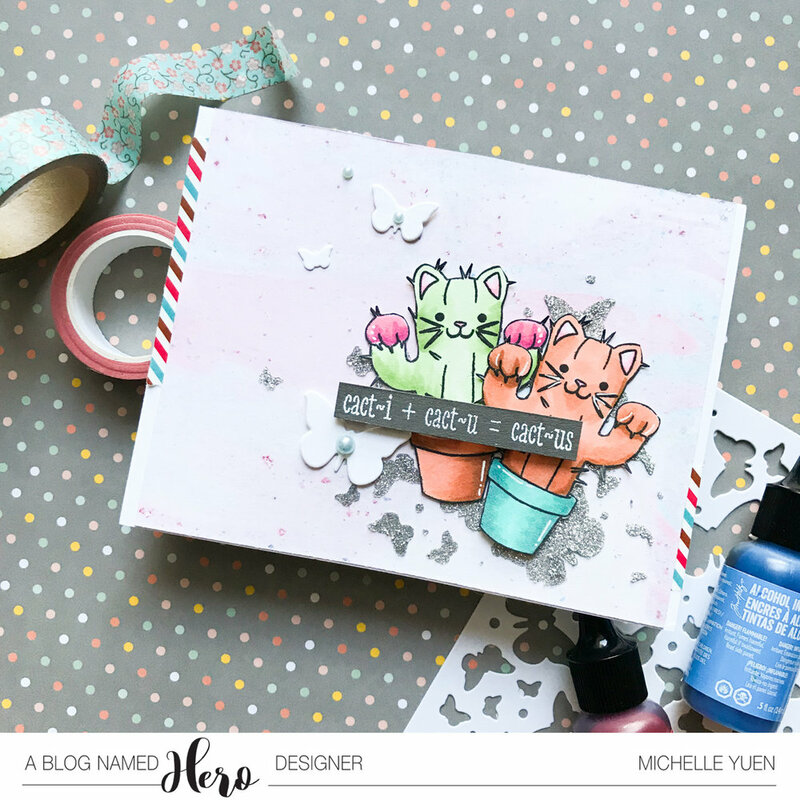 A couple of the papers I chose are from the January My Monthly Hero kit. 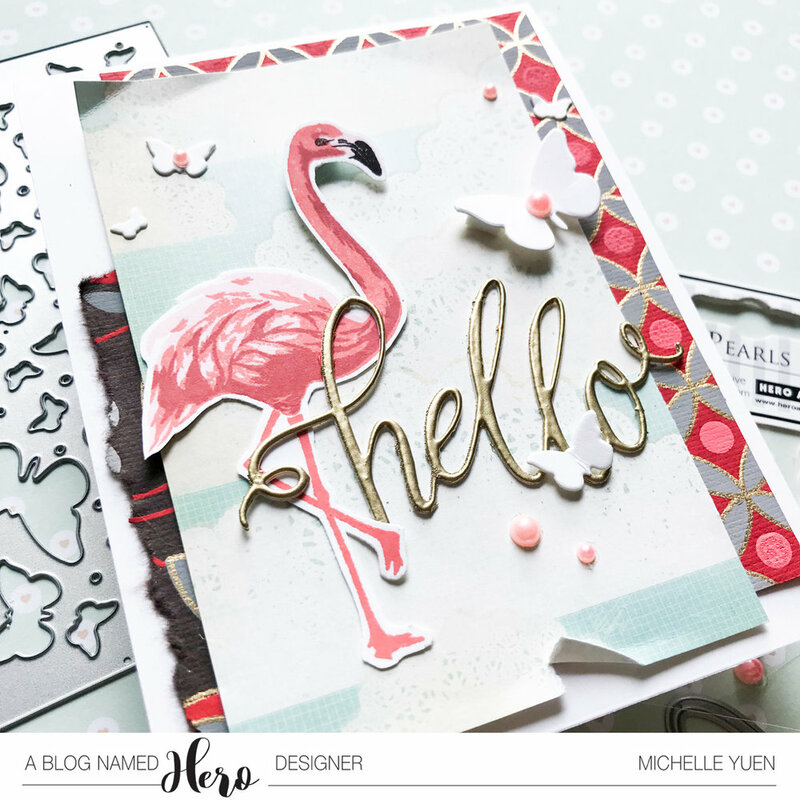 I just love this fun stamp layering flamingo! It comes together so easily, and I love how it looks like you spent so long making it. To finish off my card, I used a few butterfly die cuts that are from the negative of my butterfly background die, and also scattered some pink pearls around. 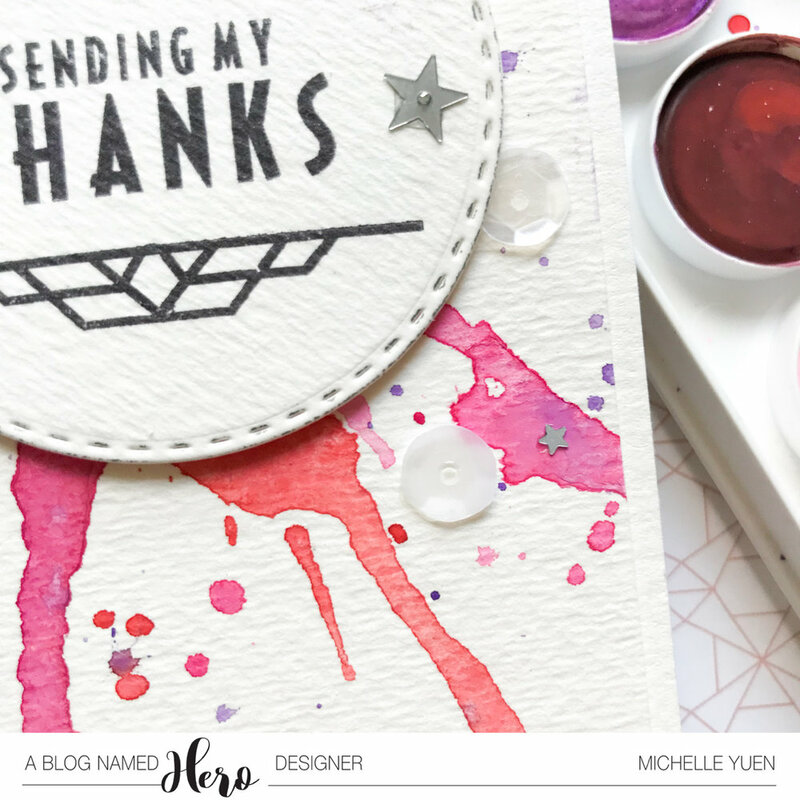 I then die cut a "hello" sentiment from the March My Monthly Hero kit and gold heat embossed the die cut. Hello, friends! 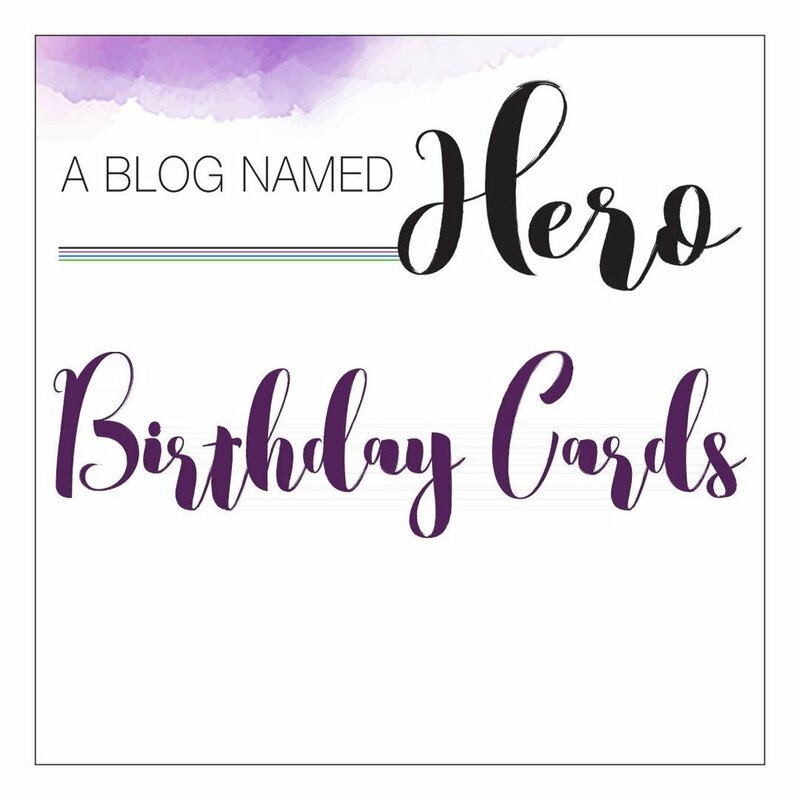 I have a card today to give you some more inspiration for the Watercolor challenge at A Blog Named Hero. This is another really easy technique that is great for those of you who think you aren't good with watercolor. This is also really fun to do with kids! For this technique, I pulled out my trusty, well-loved $5 set of watercolors - you don't need anything fancy here (especially for the kiddos) ;) I got some of the pallets nice and wet, dabbed a big wet blob onto my watercolor paper, and then used a straw to blow at the puddle to create streaks. This might make more sense in video form - you can see a quickened video of the process over at my Instagram post. This technique creates these really fun, free-form and organic streaks to create a cool pattern. I made all my streaks radiating from a center point, but you can also do this all over your card for something like an abstract Jackson Pollock look! At the end, I also flicked my paintbrush to create splashes of paint for more interest. I finished off the card with a sentiment from the Art Deco Thank You Kit. I had so much fun trying this technique out, and I hope you try it too! If you do, make sure to share it on our challenge. 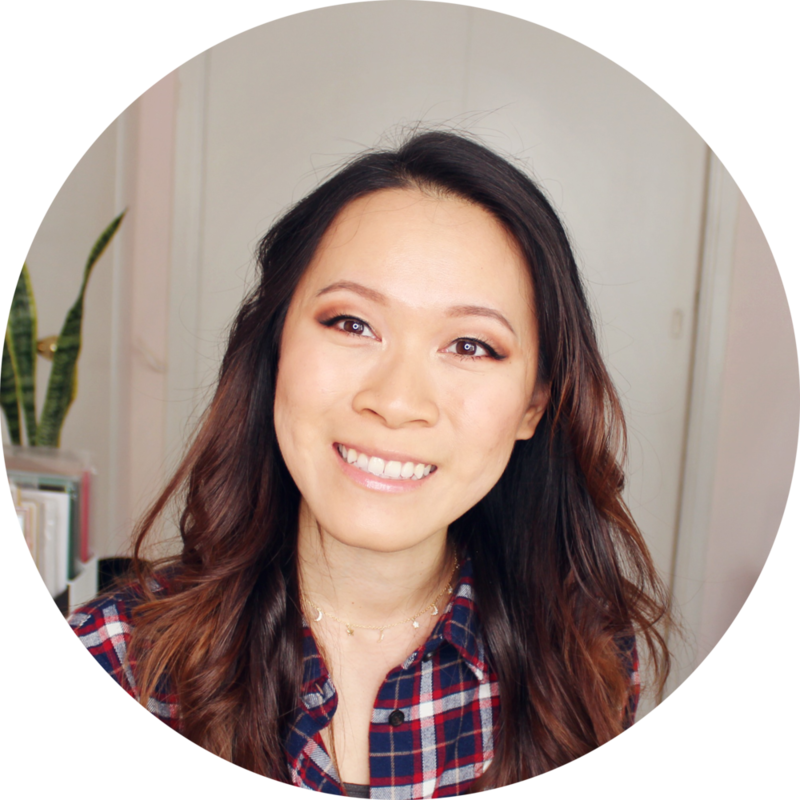 And tag me on Instagram (@michelleyuen_) because I'd love to see your projects! 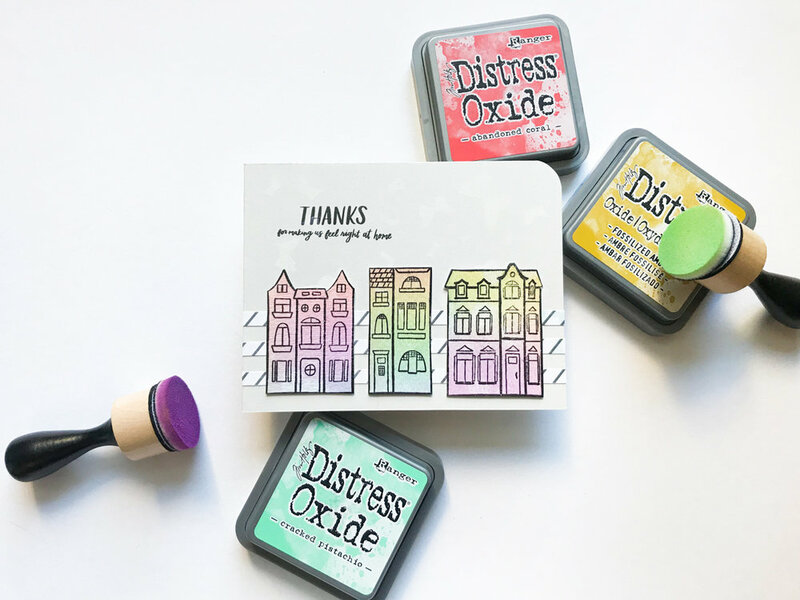 If you missed my last watercolor technique card and video, you can check it out here.